Our program offers both an MSMS-A (applied) track MSMS-T (thesis). Where better to learn about advanced marine systems than on an island in the middle of the Pacific Ocean? Our students study at HPU’s Windward Hawaii Loa Campus in Kāne’ ohe featuring 135 tropical acres with awe-inspiring views of O’ahu’s majestic Ko’olau Mountains. 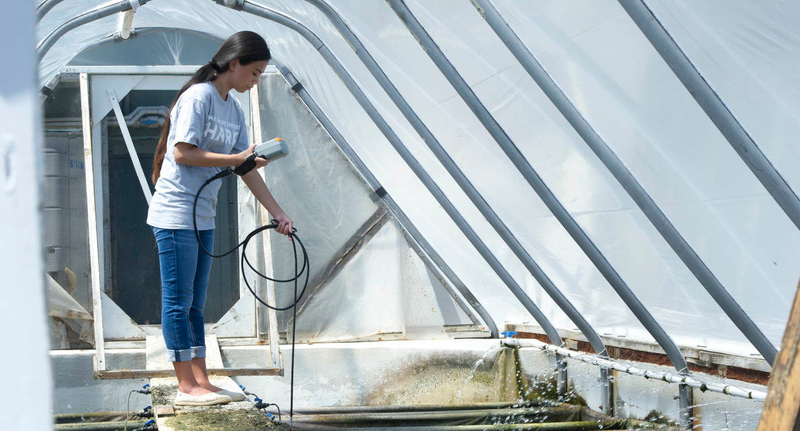 Classes and laboratory research also take place at the Oceanic Institute: a research and development facility dedicated to marine aquaculture, biotechnology, and coastal resource management. The Oceanic Institute is situated along the scenic southeastern coast of O’ahu at Makapu’u Point, near the community of Waimanalo. A baccalaureate degree in the Natural Sciences is required for entry into the MSMS program. Certain course prerequisites may be required before enrolling in graduate MSMS courses, depending on the student’s academic preparation and research interests. For students in the thesis track, the graduate thesis committee will determine whether any deficiencies exist and how these deficiencies will be addressed. Additionally, being paired with a faculty mentor is necessary for acceptance into the MSMS-T track. Demonstrate an interdisciplinary knowledge of marine systems. Demonstrate the ability to plan and implement observational, theoretical, and experimental studies. Interpret and critique professional scientific literature. Demonstrate an advanced ability to apply and integrate scientific principles and research data to address complex questions in marine systems. Demonstrate competence in scientific communication through technical and scientific reports, publications and oral presentations. Demonstrate professionalism and scientific ethics. Have the competence to gain employment in advanced resource management positions or entrance to a doctoral program in related fields. HPU offers merit-based Graduate Assistantships (GAs) that provide a 50% or 25% tuition discount for four consecutive semesters. For more GA details, go to the FAQs above. Where will MSMS take you? Biologists for multiple federal agencies around the U.S.
Environmental Scientists, Specialists, and Consultants for various governmental and private agencies, U.S.
Q: Who is eligible for HPU’s MSMS program? A: Students graduating with a Bachelor’s degree in the Natural Sciences with a cumulative GPA of 3.0 or higher may apply to the MSMS program at HPU. International students may be required to provide TOEFL scores. Please visit International Requirements for more information about eligibility if applying as an international student. Q: Besides applying, what else do I need to do to get into your program? A: To be accepted to the MSMS-T (thesis) track, an MSMS faculty advisor must agree to serve as your mentor throughout the research and thesis process. For this reason, we encourage students to begin making contact as soon as possible with faculty whose research is of interest. The onus is on the applicant to initiate contact with potential mentors. Acceptance to the MSMS-A (applied) non-thesis track does not require the commitment of a faculty advisor; the MSMS Program Director and MSMS Program Administrator work together as MSMS-A advisors. Q: How important is my GRE score? A: Rather than evaluating an applicant on the basis of GRE scores alone, we focus on how students performed relative to the rest of their test group. Our percentile breakdown is as follows: 75th percentile = Desirable, 50th percentile = Qualified, 40th percentile = Satisfactory. Applicants with scores lower than the 40th percentile will only be accepted if the student has very strong transcripts or strong HPU faculty support. Students with scores below the 40th percentile may be required to take courses in the area(s) of weakness or re-challenge the exam. Q: FOR INTERNATIONAL STUDENTS REQUIRED TO TAKE THE TOEFL EXAM, WHAT ARE THE MINIMUM SCORES NEEDED TO BE ELIGIBLE TO APPLY? A: TOEFL (IBT) overall score of 80 with a writing score of 25 or IELTS overall score of 6.0 with a writing score of 6.5. A: HPU’s Graduate Admissions website shows that an interview is required as part of the selection process, and interviews are required for acceptance to the MSMS- T track. The interview is usually a phone call between a potential faculty advisor and the applicant. Although our applicants initiate first contact with faculty, a faculty member interested in a particular applicant will set up a time to talk with that applicant via phone or Skype. Interviews are not required for the MSMS-A option. Some faculty may have grant funds available to help support their MSMS-T students; you will need to ask prospective faculty advisors about potential support for their specific research programs. For a list of external scholarships, internships, and fellowships for graduate students in the marine sciences, see the Funding Opportunities section below. Students may also apply for loans offered through the Financial Aid Office at HPU. Visit the HPU-FAO website directly for more information. The combination of a perfect location, unique research opportunities, dedicated faculty, and rigorous training propels our students toward exciting and rewarding careers in marine science. For more information about our research instrumentation please visit our Scientific Instrumentation Facilities page; for more information about careers in marine science or our vessel the Kaholo, please visit our Resources for Marine Science page.